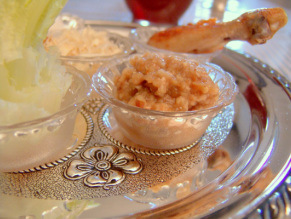 Charoset is one of the symbolic foods that we eat during our Passover seder: its name comes from the Hebrew word cheres (חרס), which means “clay.” Charoset is a dense fruit paste that represents the mortar used by the ancient Hebrew slaves in Egypt to make bricks. Because Passover celebrates freedom, a small amount of charoset is placed on the seder plate as a reminder that we were once slaves and we should not take our freedom for granted. Charoset from Acqui Piemonte – very easy, it doesn’t require cooking! Put everything in the blender and process until combined, but it shouldn’t be too smooth..
Cook on a low flame for 15 minutes, stirring. Add some sweet wine or grape juice right before serving. Combine all ingredients except for the sugar and spices in a heavy or non-stick saucepan, add about 1/2 cup water and cook on low heat for about 15 minutes. Add the sugar and spices, and cook for 5 more minutes. Serve cold or at room temperature. Coarsely grind the almonds, the dates, and the matzah. Combine with the sugar and add the wine or grape juice, adding the liquid slowly until the desired texture is desired. Place in a serving bowl and sprinkle with cinnamon.